The dwarves of Cradbrell call the petrified roots of a giant tree their home. A cataclysmic event had torn away the land surrounding the tree to expose it to the world. However, no one remembers what had actually caused it. The story that has been passed down through the ages is one of a great kraken. The kraken sought to claim a magical item hidden within Belarith’s tower home to a powerful wizard. It was in this battle between D.O.U.G. the kraken and the wizard Belarith that the cliff side was torn asunder. They left behind only the sturdiest of structures, and those were the roots of the great tree now known as Cradbrell Citadel. After those few bits of inspired lore, its time to address the picture at hand. 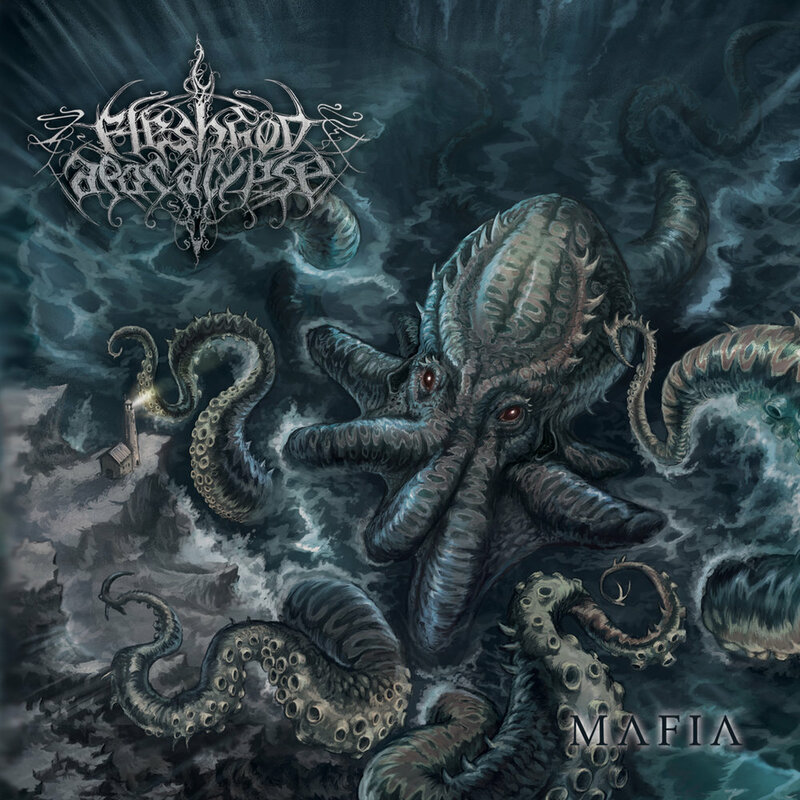 For this session I am looking at the Italian technical death metal band Fleshgod Apacolypse and their first EP entitled Mafia. You can find all pertinent links for the album at the bottom of this post. The image is very evocative of some sort of Cthulu style mythos. Given that the band name is Fleshgod Apocalypse it felt almost imperative to have the creature be one of epic proportions of destruction. I envision it being the Tarrasque of the sea, and only once every hundred years will it rise from the depths and lay waste to the earth. The lighthouse also made me think that about the intelligence of the creature and knowing the lighthouse's destruction could lead to more sunken ships and more food for the sea as a whole and it in turn, but building a creature at that CR isn't as much fun or as useful. Onto Mafia, the name of the album and my inspiration for the usable piece in this article! Doug can not act alone! Instead it has created spawn that are the precursor to its wrath, and seen much more frequently through time and place. They come swiftly as a dark cloud in the water with faint hints of their presence within it. They rip and tear apart anything in their way as the physical manifestation of Doug's desire for destruction. I give you the Spawn of Doug. Disclaimer: This has not seen any playtesting, and results may vary on use. Shout out for the post: Rich Howard @umbralwalker on Twitter is a fantastic human being. He is supportive beyond belief and an inspiration to be better to everyone that has the good fortune to cross his path. He has helped me immensely believe in myself as a creator, and become a person that I now have the joy of considering a dear friend. This crazy chaos of creature is for you Rich!